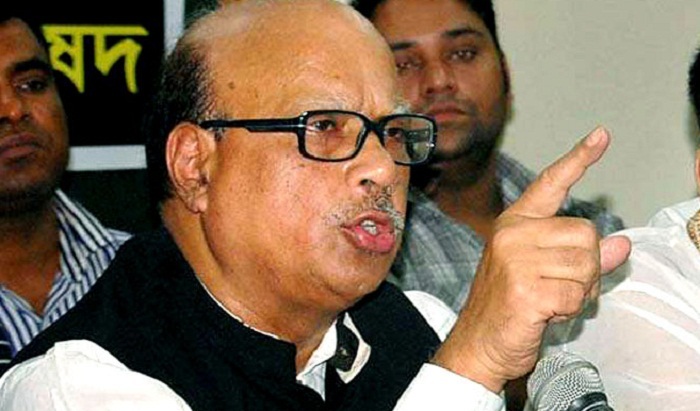 Awami League presidium member and Health and Family Welfare Minister Mohammad Nasim said here today that by her remarks on the martyrs of the War of Liberation, BNP chairperson Begum Khaleda Zia had not only dishonoured the martyrs but she had also betrayed BNP founder Ziaur Rahman. "People of the country were thunder-struck as Begum Zia raised a controversy in her remarks on the number of martyrs in the War of Liberation. She has put her party BNP in the same line with the killers of 1971, Jamaat," he said replying to a question after attending a function at the residence of Sirajganj District Awami League president Haji Ishaque Ali in the district town. Mohammad Nasim said, "Begum Khaleda Zia has become perplexed after her defeat in politics against Prime Minister Sheikh Hasina. She has now been suffering from delirium following a long friendship with anti-liberation force, Jamaat." Terming Begum Zia's remarks on the history of War of Liberation, Awami League, Bangabandhu and the proclamation of independence as blatant lies and unpardonable, the senior leader of the ruling Awami League said, "Even the Pakistanis didn't dare to come up with such obnoxious remarks. Begum Khaleda Zia has passed such unpardonable and indecorous remarks as she stayed at Pakistani army camp during the War of Liberation and owning to BNP's political friendship with the party of war criminals, Jamaat."